Temperatures are on the rise here in Michigan... I actually think spring might be here (watch it'll snow tomorrow), earlier than it typically is. With that being said I thought now would be the perfect opportunity to have a beauty conversation before sunnier days arrive. When you think of spring makeup, dewy glowing skin, pretty pastels, and bronzed cheeks are probably the first things that come to mind. I know that’s what I think of. During the spring 2019 runway shows you could find all those classic spring-time essentials, plus pops of electric pink lips, golden glitter, and metallic foiled lips. If you have been following my Instagram stories lately you’ve noticed I am obsessed with this edgy meets girly-girl trend, that popped up onto the runways for spring. I have been pairing dewy skin with plenty of bronzer and a pop of pink lips. My outfit has been a gorgeous girly tank top paired with a black faux leather jacket for that edgy meets girly-girl vibe. I am dying to try the classic cat eye look but with a pastel pink for a springtime chic, to complete my spring look. It’s kind of a Barbie meets Good Charlotte punk rock look, which I love. Also, hot off the runway is red lips and a pop of red blush with minimal eye makeup. I’ll be honest with you, I hate wearing eye makeup. Mascara, of course, I love it - the longer I can make my lashes the better. Eye shadow is a different story for me, I can’t stand it. Maybe it’s the fact that saggy eyelids run in my family and I don’t want mine to be like that so I avoid adding heavy elements to them, or the fact I don’t know how to make it look good. Whatever the case may be I was so excited to see the pop of red with minimal makeup trend on the move for spring. I am not a red fan, I am a pink fan though. This spring I will definitely be wearing a bronze pink on my cheeks for a pop of color paired with the prettiest pink lips. Gold glitter was seen foiled on lips, making a statement on eyelids and taking over nails for an extra touch of glam. Typically gold only finds its way into most beauty trends during the holidays and as someone who loves gold, you can imagine my excitement about this hue making a spring impact. One of the biggest beauty trends for spring is just doing what you love and makes you happy. With inspirational quotes and fun pictures, Nancy at Behrman really makes sure that you are focused on your own self and not what everyone else is doing. You can incorporate the beauty trends popular at the moment into your own life without having to compromise your own style. From bright pops of color to natural dewy looks spring is on your side this year when it comes to beauty trends. What is your favorite spring beauty trend? I am loving the minimal makeup! Birds have made their way back to the mitten state and the official start of spring is here. With a new season comes a new list of things I want to do, and of course, I am sharing that list with you. Without further ado, here is my 2019 Spring To-Do List. Let’s be honest for a moment, the gym can be a frightening place. Gyms are filled with complicated contraptions promising to build muscles we didn’t even know we had. With gym bros and fitness fanatics knowing exactly what they are doing and dominating every piece of equipment they use, it’s easy to find yourself on the “dreadmill,” because you don’t know what else to do. Then you think, weights! 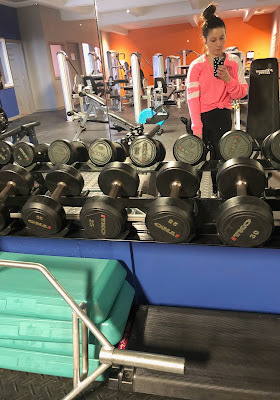 I can lift weights, but those weight sections are usually crammed with full-grown men grunting, which is enough to freak anyone out - especially someone who doesn’t know what weight to grab. 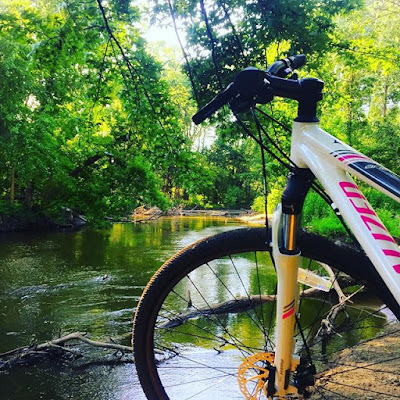 Studies suggest that lack of confidence and a tendency for women to feel self-conscious when exercising is a huge key factor in making us ladies less active. I even recently heard someone say “I’m too fat to go to the gym,” whoa, that is completely crazy and no one should ever feel like that. But, trust me I get it. I spend hours on Instagram looking at fitness routines by perfect Instagram influencers and wish my body was more like theirs. I pull myself apart, until I finally pull myself together to step foot in the gym and then I kind of shut down. You know the moment where you don’t think you look that good, to begin with and then you step foot into a gym where every female looks like Ashleigh Jordan and every male looks like Arnold - it’s intimating. But, like anyone else I have to tell myself we all need to start somewhere, and I am here at the gym instead of sitting on my couch eating Doritos that has to count for something. To help you get past gym intimation I am going to give you five tips that helped me. If you’re new to exercise, or just don’t know where to get started I highly recommend trying out some classes. Classes allow you to try a variety of exercise out under the watchful eye of an instructor. Typically you can even find a studio that is for babes only, which will help with the intimation of guys watching you. Some of my favorite studio classes include kickboxing, cycle, booty classes, barre, boot camp class, and yoga. The Barre Code is for babes only and offers a wide variety of classes. If you’re hoping that classes will be a starting point for more independent training, look for a class at a gym that utilizes gym equipment and incorporates a variety of exercises. A circuit or weight training class will include a variety of different moves, and there will be a trainer available to help make sure you have proper form. Once you are feeling confident enough you can take your new skills out on the gym floor and design your own routine based on the exercises you enjoy most. If you have no idea where to get started and don’t feel confident asking for help look to social media. There are fitness influencers from all walks of life with a wide range of body types that can help inspire you to reach your goals. Most influencers post videos and photos explaining how to use equipment and demonstrate the correct posture for the exercise. Many will even share full routines and gym sessions that you can adapt and try yourself, some even sell plans and offer challenges that will help hold you accountable. I understand personal trainers are expensive, however, you can get by with just doing one or two sessions with the trainer and have them show you proper form on machines. Most trainers are happy to arrange a one-off session to figure out a personal workout plan that you can do in your own time. This is what I did, it helped me learn how to properly use the equipment, gave me workout ideas, I learned what I should workout every day and the importance of steady state cardio. The goal of a personal trainer isn’t to have one forever, it’s to get you comfortable enough so you can workout on your own. You know the saying, “there’s safety in numbers” this applies to the gym. Roping in a friend to join you at the gym may help to alleviate some of your nerves. Having a buddy there will help you feel less self-conscious, you’ll have someone to laugh with and learn the equipment with. I love going to workout classes with friends because it holds me accountable and makes sure that I go. One of my friends and I used to meet at the gym at 5 am just so we would have someone to workout with. Having that extra support system can make a world of a difference. Remember everyone in the gym is focused on their own workout, and as much as it seems like people are staring, the reality is they aren’t. Everyone was once a gym newbie, and most people will not judge you - even if you look unsure of what you’re doing. Focus on your goals, try new things and most importantly have fun. The gym shouldn’t be a place you dread, it should be a place that makes you feel amazing. A game changer for me is wearing a baseball hat, it actually helps me just focus on myself at that moment and not pay attention to anyone else - mainly because I cannot see anyone else when I am wearing it. CALIA by Carrie Underwood sells baseball hats in a variety of colors, therefore, you can find one that will go nicely with your outfit. Or a solid black one is always nice, since black typically does not show sweat. I hope these tips have been helpful, if you have any gym concerns or questions please feel free to leave a comment or message me! When someone asks me what my favorite sweet treat is, my answer is always macarons. French macarons are small round thin meringue-like cookies that are sandwiched together with some kind of filling. The meringue is what makes these cookies unique. They have a smooth, crisp shell and a moist, chewy interior. The fillings can be whatever you dream up from decadent sea salted caramel to buttercream frosting and everything in between. Macarons are a French staple and if you happen to be in Paris (I've never been, but it’s on my bucket list), you’ll have no trouble finding them at a bakery. Back here in the US, these delicious treats are growing in popularity, and take some searching to find - especially ones that are actually good. While in New Orleans with my grandparents multiple years ago I tried my first macaron at Sucré. New Orleans is a French city, and Sucré has a pastry chef straight from Paris, therefore these little delicious wonders were as real as real gets. You can imagine it was love at first bite. From then until now I have tried macarons anytime I see them at a bakery, and nothing has come close to comparing. A couple years ago the guy I was dating went to Paris for a work trip and brought me back 12 of the most delicious macarons I have ever tasted. 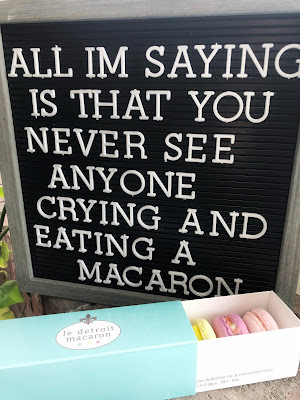 They were just like the ones I remember having when I was in NOLA, and since then that flavor, texture, and amazingness has never left my mind and I have been on the hunt for a real macaron since. Naturally when I heard of a place called “Le Detroit Macaron” I knew I would have to make the trek out to their shop. Straight from the Le Detroit Macaron website, it says “Anyone who knows their history, knows that Detroit, at its beginning, was French. 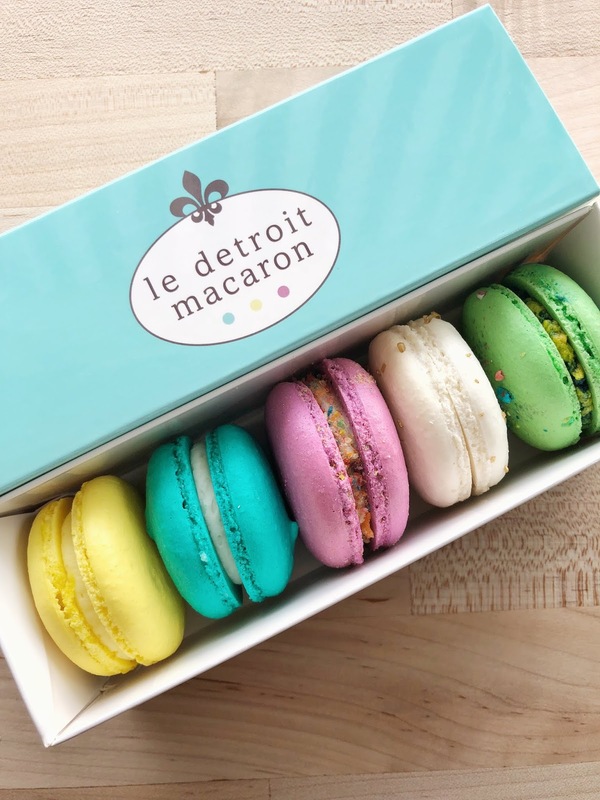 Le Detroit Macaronby pays homage and respect to that beginning.” The website also states that they use traditional, French macaron method that results in a firm outer-shell with soft insides. 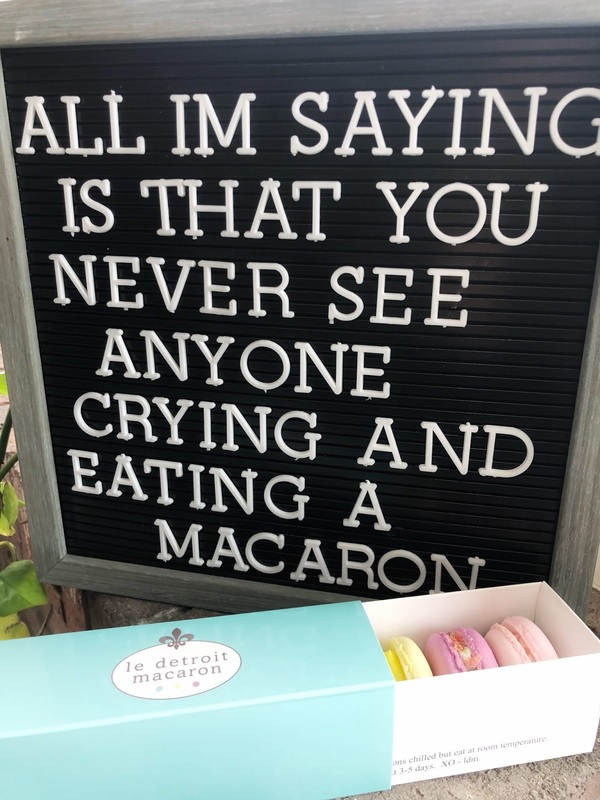 Le Detroit Macaron ONLY sells macarons, and when your specialty is one thing you better know what you’re doing, and guess what - THEY DO. You guys, it was love at first bite - the macarons tasted amazing, and were actually FRESH!! There are a couple of local bakeries that sell macarons with so much potential - however, they freeze theirs which ruins the taste completely. 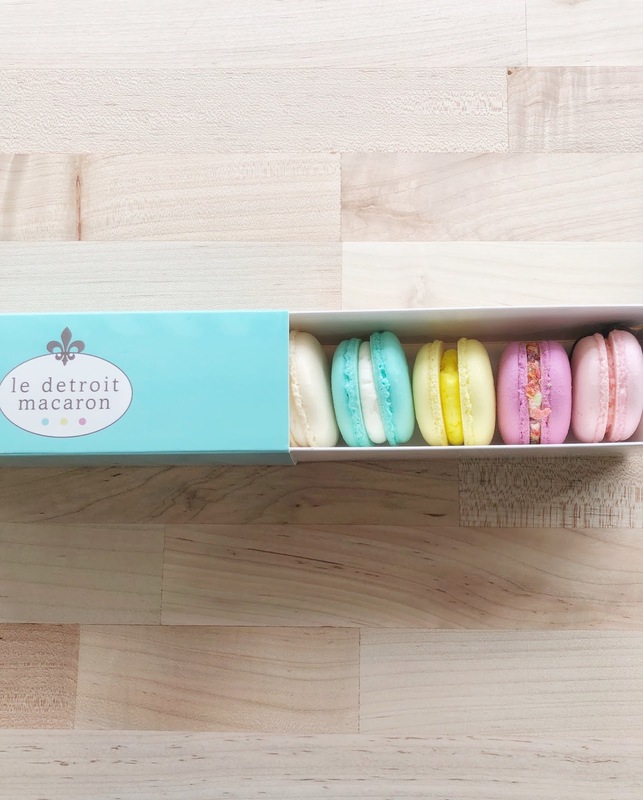 Le Detroit Macarons fulfilled all of my macaron dreams. Hamtramck is about an hour away from me and worth every minute of that drive to get these delicious little treats. 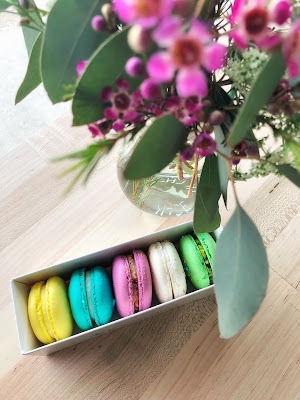 If you want to taste a traditional macaron, and feel like you’re in a dainty little Paris shop for just a moment - I highly recommend going to Le Detroit Macaron. From their traditional flavors, my favorites are Almond, Lemon Zest, Fruity Pebbles and Creme Brûlée. You can also get custom 5 ($12) or 10 ($24) macaron boxes. On March 7th, my best friend Brian lost his battle with cancer and passed away. Brian and I had been friends for twenty plus years, and throughout that time he dealt a lot with my confidence issues. He worked hard to make me see the positives instead of the negatives in life. That being said, you can imagine how much love and light he brought into my life. Now that he's gone I am on my own to keep myself from falling into negative self-talk. One thing I have decided to do is write small aspirations on sticky notes and place them on my mirror. 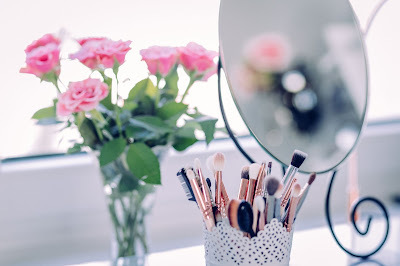 Since I look in the mirror first thing in the morning while I am getting ready I have noticed that they have definitely made an impact on how I begin my day. That's why I wanted to add some light into your life by sharing 15 small everyday aspirations. 15. Think "Yes I can"
Where my single ladies at? This one is for you! 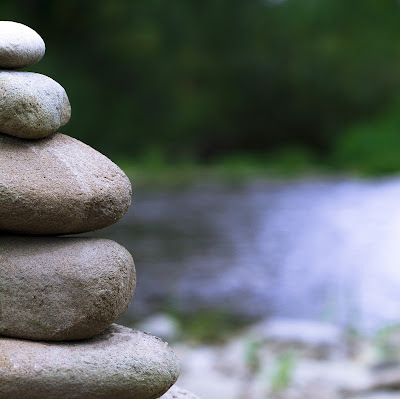 I started writing this article in December, and was going to throw it at you in January and get all cheesy about how we make resolutions for so many things in our lives, why not resolve in matters of the heart. Then, I decided to step back from that aspect, at least the whole new years resolution cheesy part of it. If 2018 wasn’t your year in the relationship department, maybe 2019 is the time to refocus on you and what your heart needs. Here are seven tips that will help open yourself up to finding love. Write down all the good qualities you have as a mate and all your bad qualities. Pick two good qualities you want to improve that would make you even more attractive to potential mates. Now pick two negative qualities you can reduce or eliminate that will make you more attractive. I will give you two personal examples: my good quality is I am very caring and like to do little things for people that matter to me. My biggest negative quality is I have body image issues and constantly call myself “fat”, and dismiss compliments. Relationship sites claim that one in five relationships start online. That means four in five start offline. Follow the offs and get out there. Expanding your social circle, taking new workout classes…etc will increase your chances of finding that special someone. Prepare your space with the intent that you’re getting it ready to entertain a potential partner. If your space is dirty and cluttered, it conditions your mind to think that your space is not ready for someone and gives you the excuse not to meet potential suiters. 4. Get rid of things that remind you of your ex…. thank you, next! Your ex is an ex for a reason, if reminders are around they will trigger your mind to think about your ex instead of shifting your focus to meeting someone new and wonderful. Make a list of things you want and stick to it. Don’t waver your desires or compromise for someone just for the sake of being in a relationship. Wait for Mr. Right and not Mr. Right Now. Being hard on yourself because you are single manipulates you into feelings of despair. Forgiving yourself creates hope for what’s to come and eventually feelings of happiness. Positive vibes are far more attractive than negative ones, so be kind to yourself. Learn what your love language is so you know what you require in a relationship. Most people love to talk, but few are really good listeners. When you pay close attention, you can learn so much about someone.